I have wanted to hop on the Butter London train for absolutely ages. They were really hard to get hold of in the UK for quite a long time, and after seeing the shade "brown sugar" all over the Web a couple of years ago I was really hankering for it. I unfortunately still don't have that colour but have finally made the leap and got 3 shades from Butter London that I picked up in Boots. I blogged about the rose gold shade here, but I wanted to do an updated post now I have spent 2 weeks wearing the polishes. In my last post all I could really comment on was the colour because I had painted my nails for the post, but now I have worn another shade all over my nails for an entire week I can say that I really like the formula of the polish as well. It goes on nicely, you definitely need two coats to get a nice even opaque colour but the polish has really good staying power which is all you can really hope for from a higher priced polish. You don't want to fork out and then they chip straight away. The photo's below are my nails after one week of wear, the chipping is really minimal and I could get away with a few more days if I wanted to. My only complaints are that it's quite pricey per bottle at £12 each and on top of that you get slightly less per bottle than other premium brands. Butter London holds 11ml per bottle whereas OPI have 15ml. The other little niggle I have is the packaging, although it looks pretty I found the lids really hard to get off and kept pulling off the main square bit to be left with just a little nodule see below pic to make more sense of my bad description. Has anyone else had this problem, or is that just how it's supposed to be? It just gives you a little less to grip when trying to paint. My overall impression of the brand is good, I would buy again because they have gorgeous colours, I just wish they were a little bit cheaper to bring them in line with other brands. The colour featured here in case you're interested is Kerfuffle. I am constantly coming across photos posted to the internet by beauty and nail enthusiasts keen to show off their latest nail colour or creation. However the amount of those blog posts, twit pics and Instagram shots that make you shudder and think why on earth would you think that looks good? I'm not talking about the shade of polish used because that is of course speculative, what one person will love another will hate, what I am talking about is how terrible the paint job is on these nails. It is simply not cute to have nail polish all over your cuticles or down the side of the nail wall, nor is it cute to have smudges and dinks in the polish either. If you are going to tweet, post or instagram the up close photos of your nails, make sure they look good first! After all I'm pretty sure you wouldn't post a photo of your make-up if your lipstick was smudged or all over your teeth would you? Painting nails take patience and skill but practice makes perfect. I have put together a little tip list of things you should know in order to improve your nail painting skills. Take your time, don't try and paint your nails in a rush, this will only end badly! Good lighting is essential or else you will end up making mistakes, make sure you're not casting a shadow over your nails when you bring the brush in towards them or you won't be able to see how close to the edges you're getting. Don't overload your brush with too much polish or else it will flood your nail or drip everywhere. A couple of thin coats is better than one thick coat, this way it will dry faster and is less likely to get air bubbles and dinks in the end result. Dip your brush in the bottle and then when drawing the brush out wipe the side closest to your body on the edge of the bottle, that way the product is left on the side that will sweep across your nail and you don't have to start spinning the brush round. Place the brush down a millimetre away from your cuticle and then nudge the polish back towards the cuticle, this way you won't end up flooding the cuticle with too much product but you can still get in close. Make sure you have enough space, it's easier to paint nails at a table so you have somewhere to put the bottle down and can put your hands out flat. If you are trying to hold the bottle as well as paint you are going to be concentrating on keeping the bottle upright and not giving your nails your full attention. Have an orange stick or dotting tool handy, that way if you do get too close to the cuticle you can run the tool around the cuticle to create a nice smooth line. Another trick for cleaning up the edges is to use a small angled brush dipped in polish remover and run it around the edge of your nails and cuticles to ensure a clean result. I know it's hard to explain some of these steps rather than showing you, so if you have any questions I will be happy to help. I will admit that my cuticles have been in a terrible state recently because I have really been neglecting them. I decided I needed to take a little more care, and nurse them back to health! I bought a couple of products from the Sally Hansen range, a vitamin E cuticle oil and the Cuticle Rehab. I have been using them every day for a few weeks now and I am slowly noticing the difference. I'm not sure if it's because my cuticles were in such poor condition that its taken so long for them to start recovering or if the products just aren't as potent as I had hoped for. I have been slopping on copious amounts of the vitamin e oil when I'm at home and I keep the cuticle rehab in my bag and use it at work. Cuticle oil is always great to have for nail posts as using it before taking photos makes your cuticles and fingers look healthy, so for that reason I like having it around. I haven't noticed that it was really worth it's £6 price tag and I'm sure a cheaper one would have done the same job. The cuticle rehab comes in a handy little tube with a brush applicator which makes it great for when you're on the go, I love having it in my handbag and find it really handy. It's a thick gel like consistency so it doesn't drip all over the place when trying to apply it, and it smells beautifully of cucumber and melon. Out of the 2 products this one is my preference by far. I've been trying really hard to get into good habits with looking after my nails and cuticles, I will admit there have been a few days where I have fallen off the waggon and forgotten to put anything onto my cuticles and I have noticed the difference very quickly. My cuticles dry out so fast so I now know I need to try harder at remembering and getting into a good habit with it. The vitamin E oil sinks in relatively quickly and I will admit I apply a hell of a lot at a time, there's nothing worse than greasy fingers. So far the progress is good, I just need to keep up my end of the bargain, and remember to keep applying them! I have wanted to try them forever and finally took the plunge and got 3 from boots. The first one I wanted to give a whirl was the stunning rose gold coloured polish. In the bottle it actually looks a little more on the champagne side but once on its beautifully rosy. This little delight is called Goss and is such a beautiful shade, it's quite metalic and just looks gorgeous. I decided to do a twist on a french mani with it. I am in love with the way it looks, what do you guys think? This is the first time in my life I have ever walked into MAC and got this many items. I felt a very lucky and spoilt girl as it was my generous boyfriend who treated me to these. 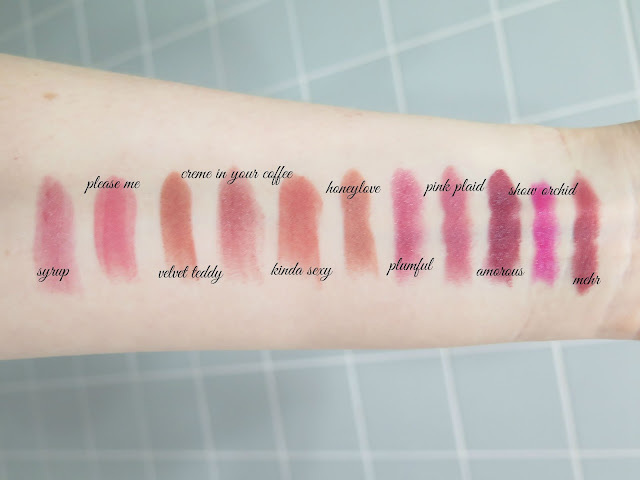 I love MAC lipsticks, I think they are great quality, and love how rich and creamy the formular is and how nourishing it is for my lips, the fact that they have super cute names helps as well! I have spent some serious time oooing and ahhhing over swatches on the Internet deciding which shades I wanted the most. I picked quite a few pinks and neutrals because I love those best for my complexion. I'm so happy with selection of colours to add to my collection. I can't wait to start wearing them all (now I have photographed and blogged about them obviously). I understand I have a lot of pale pinks and beige colours and I also understand some people may say some of them look the same (mostly men) but they have beautiful subtle differences and I love them all! There's something so chic about MAC packaging, I get little butterflies in my tummy looking at all the lipsticks piled up. I think I may have a little problem, and may or may not stop until I have every lipstick in the main collection which means for more than half the year I would need to wear a different lipstick every day to use them all, but what the hell! I may suffer from a little addiction to shower gels, I love standing in a shop with a huge array to choose from and sniffing my way from bottle to bottle picking out my favourites. Generally speaking the creamier and sweeter the better; anything labelled vanilla, shea, cocoa butter or milk immediately has my attention. You can imagine how I happy I was to spot the vanilla and raspberry shower gel from Origins, it literally smells like strawberry milkshake. Showering with this makes you dream of sitting in some cool diner somewhere sipping on one of those shakes with whipped cream and a cherry on top. I love so many of the origins shower gels, and it helps that their products are totally vegan and they don’t support animal testing which is always important. The only downside to this particular shower gel is it seems a lot runnier than their other shower gels. As soon as you open the cap it comes pouring out at lightening speed! They are currently on offer in Boots for £1 so go and stock up whilst you have the chance!